The Vortex V700 is a light commercial Spin Bike bringing the Spin Class to your home. The trainers choice. Designed in the USA to meet international athletic training standards. Rated for use by high performance athletes. The front transport wheels make it easy to move your V700 Spin Bike around your gym. Extremely heavy duty and durable frame providing the most intense, stable and safe workout sessions for users up to 125kg. 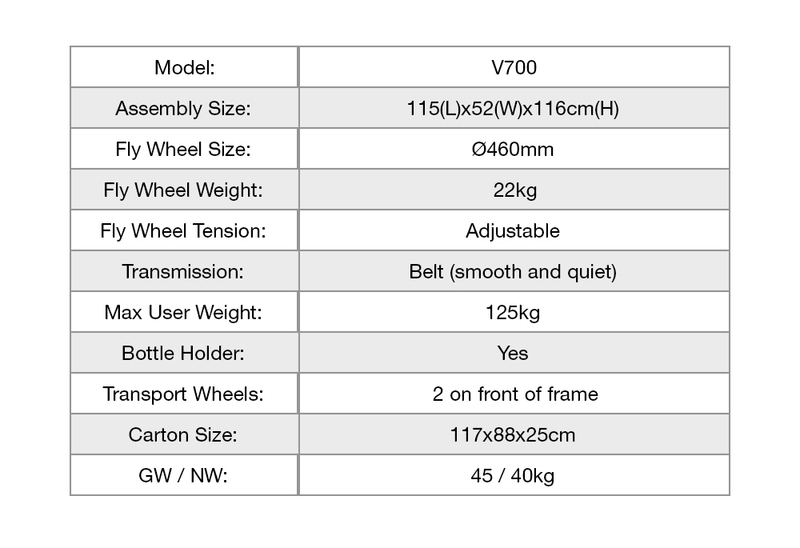 warranty information The Vortex V700 Spin Bike comes with a lifetime structural warranty and 1 year replacement for all moving parts and electronics when used in a home or studio environment. Not too hard to assemble and goes really well. It was just what I was looking for.